January | 2008 | ARChive of Contemporary Music, or "Would You Take My Mind Out for a Walk"
One of the nicest things about the ARC is the nice people who pop up over the Holidays, the nicest time of the year. 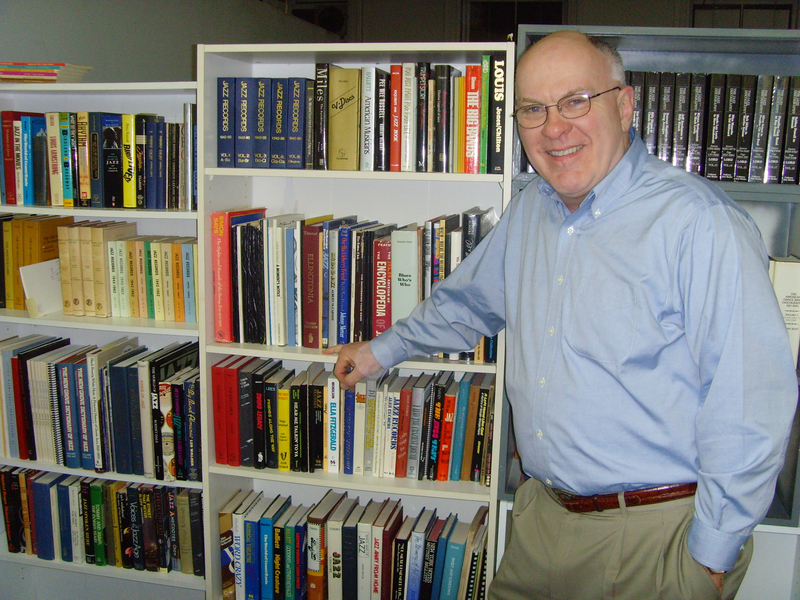 So Here’s to jolly, saintly, James Doran, who gave us the nicest gift of all to round out the season, 308 jazz books! Jim is a long-time ARC supporter, who’s passion is piano jazz. He has authored Herman Chittison : A Bio-Discography, (International Association of Jazz Record Collectors, monograph No. 2, 1993), and made a major donation of his work, as well as that of Erroll Garner, in the past. “Written by America’s No. 1 Authority on Be-Bop” this book looks beyond the eccentric personality angles of the bop cult — the goatees, berets, and other superficial manifestations — and instead focuses on more serious aspects of the music. Includes a technical explanation with musical illustrations, biographies, photos, and a list of albums suitable for a general introduction to bebop. Hot Discography was the first attempt to systematically list all “hot” jazz records along with the personnel for each performance. Evidence that jazz discographies can succeed when focusing on something other than original pressings of the material. According to the author the compact disc has done more to perpetuate Duke Ellington’s legacy than any other retrieval format. Includes documentation of over 1,000 Duke Ellington related compact disc releases. The collection contained plenty of other distinguished discographies, including many from Greenwood Publishing focusing on, among others, the Prestige, Savoy and King labels, 25 volumes of The Jazz Discography by Tom Lord, and a whole shelfload of titles on women in jazz; I Had the Craziest Dream by Helen Forrest, American Women in Jazz by Sally Placksin, and Jazz Women at the Keyboard by Mary Unterbrink. You can see the complete list of everything donated on our webthing. Jim also donated 176 LPs and as clever as we think we are, we had to be told that the one person common to every disc was pianist Tommy Flanagan. Stealth themed donations are encouraged. You should all give it a try!